All HERMANN-Coburg Teddy Bears are completely manufactured in Germany. With the work place in Germany we confess our social responsibility for those women and men, who produce our Teddy Bears. Our social competence is reflected by the Social-Quality of our Teddy Bears. All our employees and workers work on the best social conditions. The working conditions of our workers are safeguarded by the high standard of German social laws and by the high demands of the German industrial safety laws. In harmony with the German legislation we refuse any kind of work by children or pressure work. In accordance with our high-class quality demands our workers are liable to no quantitative output stress. All HERMANN-Coburg Teddy Bears are high-grade hand-made products, made by talented and trained skilled workers. Our responsibility for our world around us applies to the material we use and energy efficiency. Our Teddy Bears are produced with a minimal consumption of electric energy resources. We use only high value materials and selected natural fabrics. All our Teddy Bears are created by our own ideas and designed by our own design studio, if not otherwise specified. Several of our models have won internationally recognized awards. All our Teddy Bears are standing on the solid foundations of more than 90 years history of our company and base on generations of overlapping knowledge and experience about making of good Teddy Bears. 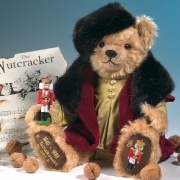 All HERMANN-Coburg Teddy Bears come from one of the oldest today still existing Teddy Bear companies in the world. The sign of all our Teddy Bears is the “neck mark” in triangle form, the fabric label and the green HERMANN hang tag. They are 5-times jointed, if not otherwise specified.